Appropriative processes underpin the work of Scott Myles, in particular the degrees of change through the process of repetition of original gesture, attitude, form or positing. His sculptures, spatial installations and screen prints refer to structures of existing ideas and artworks, particularly within their original context, which he then appropriates either formally or in content. Yet, in the moment of citation or imitation within another context and via repetition, the appropriation deviates, in a way that not only reflects the original idea but is also an authentic presentation of something else, something personal. Myles’ installation for OPEN SPACE at Art Cologne in 2007 can be read as paraphrasing Friedrich Kiesler, the architect and visionary, who in 1942 developed legendary designs for the Peggy Guggenheim gallery, and attempted, ‘to create a new system of coherence between architecture, painting and sculpture as well as accomplishing a connection between these and the viewer. This new correlation system describes a method for “spatial exhibition”’. The open booth setting of Myles’ installation can also be seen as an iconic stereogram for his practice. 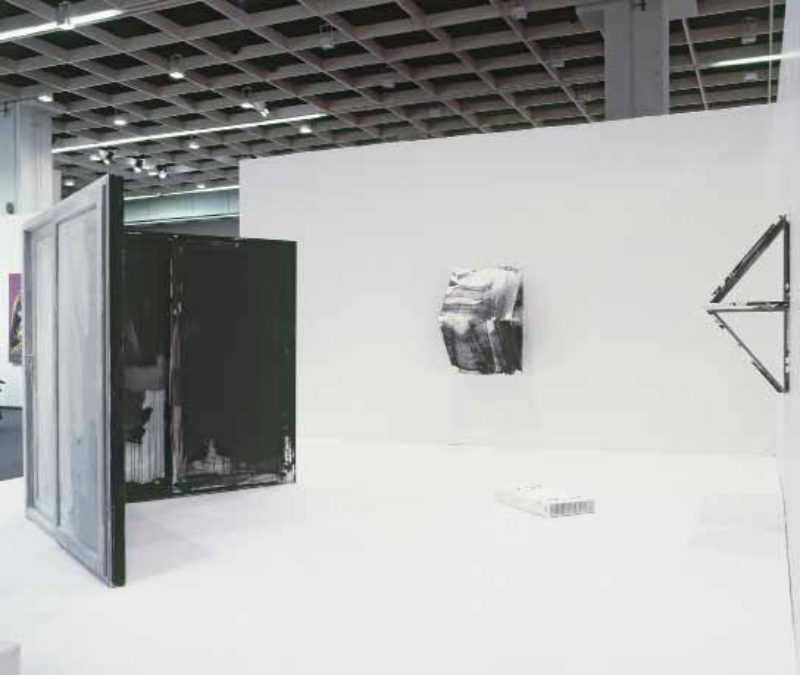 He uses a typical ensemble of modules; a double-glazed door painted black and white in ‘Cracked Actor’, 2007, and two double shelf sculptures in ‘Couples’ and ‘Advance Wearing Mask’, 2007, surround and equally define the open space. The door piece functions as a concave, vertical screen, limiting the exhibition space to a measured area. His ‘shelves’ advance both convexly and diagonally into the space and at the same time imply a sculptural presence, as does the floor piece ‘Untitled’, 2007, which depicts an overturned radiator, cast in bronze and powder-coated white. Every element of the installation stands in balanced, spatial relationship to the room, inviting the viewer to inspect and reflect upon the piece accordingly. The functionality of the objects is overridden by a doubling of formal elements inherent in the work; the shelves become their own supports, the doors, posed as partitions, act as their own stabilisers. Provided with a gestural and painterly surface, they are at once autonomous sculptures as well as functional displays. They remain in this state of duality, having seemingly been constructed with this ambivalence in mind. Myles’ intensive examination of the terms of chance, mirroring, ambivalence and dichotomy is the point of departure for a body of work which deals with Laurence Sterne’s social novel The Life and Opinions of Tristram Shandy, Gentleman (1759-67) and at the same time significantly defines his entire oeuvre. Sterne’s rejection of a chronological, causally linked narrative structure is formally reflected by the unorthodox typographical design of his original edition. Random paragraphs, psychologically laden lacunas or gaps in the form of unprinted, blackened or marbled pages inside the book as well as the unusual punctuation—dashes of variable lengths, arabesques, capital letters or full stops are used by the author as a medium to guide readers’ eyes past the trivialisation of a complex and ever-changing reality and to restructure the narrative into a multilinear hypertext. In Myles’ square-framed photograph, ‘Full Stop (The Life and Opinions of Tristram Shandy, Gentleman)’, 2007, he addresses the open structure of the narrative literally using the last line as a final punctuation mark. Photographed from the first edition copy of the book and blown up to an extreme size, the black ink moves in unregulated form and density between the fibres of the paper. In place of the clear, circular contours of the full stop, there is a stain, the product of chance and a disturbing factor within the traditional regulations of image and visibility. Similar to the Rorschach test, the enlarged ink blot gives space for free association. The second equal format photograph, ‘Full Stop (Bootleg, The Life and Opinions of Tristram Shandy, Gentleman)’, 2007, displays an almost monochrome surface of white-noise as counterpart, guiding the viewers’ gaze towards the centre of the page where there is a black, scale photograph of a full stop. Contrary to the almost unrecognisable, enlarged original, this full stop originates from a bootleged edition of the novel, which Myles has specially adopted for his own artistic process. He refers to the cycle of the evaluation of things as he did in an earlier newspaper project in which he borrowed magazines from station kiosks, read them during the journey and at the final destination deposited them at another newspaper stand, supplemented with a printed flyer containing a statement about the project and Myles’ name. The white page of Myles’ photograph opens up immediate associations with the blank page, with the blackened front and back pages of the original Tristram Shandy text through which the narrator confesses his sadness for the unexpected demise of a literary character. Associations are also made with the custom-made, coloured marble page within the story, which would usually be used as end pages. Sterne names each of these organically textured pages a ‘variegated allegory of my work’. Scott Myles imitates the traditional marbling technique which Laurence Sterne used for 4000 limited edition copies of Tristram Shandy, either in his double shelf pieces or classically on aluminium sculptures, such as recently in the expansive, multi-winged, free-standing sculpture ‘Das Ungleiche Paar (EVOL) (The Unlike Pair (EVOL))’, 2008. Just like the single full stop, the bubble-like colour gradients of marbling play with randomness and hark back to the art historical topos of the unpresentable that affirms itself as an undefined, open structure. As Myles’ photographed full stops mark the end of the novel or its separate narrative sections, the shape of the work ‘I Column (The Life and Opinions of Tristram Shandy, Gentleman)’, 2006 symbolises either the Latin I at the beginning of the first chapter, or the narrative I. Myles’ first ‘I Column’ sculpture (2006), has two elements, a stainless steel capital I resting on a black lacquered plinth, marking the beginning of a narrative. The object not only reflects the room and its objects but also a form of introversion. In enforcing an identity, it mirrors ‘the ego in the world and the world in the ego’—Maja Turowskaja refers here to Andrei Tarkovsky’s 1973/74 film, Zerkalo (The Mirror), which, as with Laurence Sterne, converts the non-linear, associative and continuously self-reflecting stream-of-consciousness narrative technique into fine art (Turowskaja/Allardt-Nostitz: Andrej Tarkovsky. Film as poetry and poetry as film, 1981). Sterne and Tarkovsky’s conception, art should never be explicit but instead should unify contradictions. Myles transfers this approach to dichotomy in his artistic procedure. The central artistic moment is displayed in the disparate coupling of image and object, reality and illusion, from social product and autonomous artwork. His second bronze cast and painted piece ‘I Column (The Life and Opinions of Tristram Shandy, Gentleman)’ from 2007 is a display of the title itself. It is a pedestal, as well as an autonomous and minimal object, legible in its cuboid form, repeating the ‘I’ of the narrator. High quality bronze is hidden under a black and white layer of paint. As in Jasper John’s Sculptmetal pieces, Myles employs overturned chairs ‘Untitled (Chair)’, 2007, radiators ‘Untitled’, 2007’, bottles and glasses ‘The Contents of a Mini Bar’, 2004/2007, or scoops of ice cream ‘Ice Cream Paperweight’, 2002, as ready-mades, forming them from bronze casts and acrylic paint. The contrast between high and low art, which is primarily expressed through the choice of subject and material, is not a presentation of a taboo infringement but instead opens up a reference system of literature, film and the fine arts. Myles toys with taboo in the context of historical reference and poses contemporary artistic and social questions. His appropriation of Felix Gonzalez-Torres’ posters, and his addition of text in black ink to their reverse, recirculates the artistic cycle in ‘Pointing in One Direction’, 2003. The blank page becomes a projection screen for operation instructions and offers the artist as well as viewers the possibility to act and react freely within the system. The posters manifest the notion of gift and cycle of appropriation as well as transformation. Gonzalez-Torres piles them on top of one another, forming minimal cubes set out both as giveaways and as a prompt for the volatility of sculpture. Myles’ appropriations are realised in Plexiglas displays with metal pole supports rising like flags. The motif of the carrier as burden becomes, with Friedrich Kiesler, a continuum without any division between wall and floor and serves as a citation and optical support for Myles’ fragile construction. The white backs of the posters carry simple messages, daily codes of speech such as ‘Learn the language’ or ‘It hurts’, challenging the viewer. This gesture of appropriation serves to articulate Myles’ interest in entropy and hierarchy, gifts and return gifts. As a ritualistic process of exchange, the cycle of gift giving is displayed in the Potlatch festival that French sociologist Marcel Mauss, has studied in relation to the obligation of giving, taking and reciprocation. The resulting system of dependency interest Myles in that they initiate a conflict of social interactions. In his solo exhibitions Askit (The Modern Institute, Glasgow) and Missing Words (TMI at Sadie Coles HQ, London) both 2007, Myles summarises the principle of doubling, renewed in aspects of mirroring and dichotomy. This principle is visible through the repetition of shaped elements in his wood or aluminium objects. Particular aspects of Myles’ artistic work are paradoxically laid out and unified as self-evident antipoles of transparency and opacity – industrially manufactured screen prints on handcrafted marbling; moments of determinism and chance are invoked equally. As with the floor sculpture ‘One plus One’, 2007 (Missing Words Sadie Coles HQ), the doubling of another object is reflected from the frame of a bay window which has been painted and acts as a formal variant of the black and white marbled shelves, ‘Twins’, 2007. Its display is turned into an ambivalent placeholder for function and transformation. In the London exhibition, the visitor is at first glance met by their own double through a single windowpane replaced by a mirror reflecting themselves. It is only on second glance that the white bronze sculpture ‘Hello, it’s me’, 2007 appears in view. If, since antiquity, the mirror has identified self-reflection with archetype, the mirroring of oneself displays the ‘other’. As Otto Rank formulated in his psychoanalytic study The Doppelganger, 1914, the reflection in the mirror bares it’s own shadow and the immortal part of the self. Sigmund Freud has analogously described the Doppelganger (tying in with Rank) as oppressed ego and as ‘the uncanny’, an appealing instance of the compulsion to repeat oneself. These aspects of psychoanalysis are also decisive in Myles’ dichotomies, not only because Rank’s work displays one of many references for the artist, but also because it is positioned beside a reflection of the self as other to the stranger in oneself and to the deflection of repetition, such as in his sculpture ‘Das Ungleiche Parr (EVOL)’ (The Unlike Pair (EVOL)), 2008, for the exhibition‚ On Interchange—Interludes of a Collection in the Museum Kurhaus Kleve. Myles’ complex, tri-winged sculpture, the shape of which is similar to a system of movable walls or an apparatus from a natural history museum, registers the principle of doubling on diverse levels: formally as a two-sided frame, each side having two daylight neon lamps, aluminium plates in two parts as well as a duplicated surface finish using marbling and screen-printing. This pair of plates, positioned like a book’s page, directly reflect the surrounding space with windows, fixtures and doorways. Along with reversed screen-prints depicting one of Robert Indiana’s ‘LOVE’ sculptures (previously displayed in the same room of the Museum Kurhaus Kleve immediately prior to the exhibition On Interchange…) replacing the mirror that was used to capture the original images of Indiana’s sculpture, photographed by Myles during the Indiana retrospective. Myles’ sculpture displays the ghost of Indiana’s, in a gesture that implies a trace history of the original work and the gallery itself. The title of Myles’ sculpture ‘Das Ungleiche Paar (EVOL)’ (The Unlike Pair (EVOL)), 2008, refers to the story of an odd couple, a joker and middle-class woman in Arnt van Tricht’s ‘Towel rail as couple’, c 1535, in the Museum Kurhaus Kleve’s permanent collection, another artwork with love as its central theme. Myles’ sculptures, photographs and prints become a factual and symbolic mirror of different epochs reflecting both the deep and abysmal aspects of doubling. In the final instance, clear interpretation is consistently withdrawn, due to the applied directness of the work.